AWESOME info, That means only 84 were built after mine, not that it matters but its sad that GM chose to stop building this great toy! We're developing an awesome library of information about SSRs. I 'd like to see a new section in the library with this thread, Reb's Vin Registry, the Two-tone registries, and the fine work Mike Byers is doing to track the last trucks in each series. If they're all in the same area, it should be much easier to keep track of. I am working on THIS one today. Having some technical difficulties. I'd be interested in putting Byers work in there when it is completed. I don't think I will put Rebel's in as his thread is still dynamic. I would like to only put info that is not going to change. What info would you need besides my VIN (1GCES14H05B116221) to tell me all about my Aqua Blur SSR? Please post all Build Info requests into this forum. I notice that a quite a few people know the production number for their SSR. Can someone let me know how I can find out this information on my SSR. Your last 5 numbers on your VIN# will tell you your position in the SSR build sequence . If you want to know your build information please click on the link below and then you can request it, that is after you supply your VIN# that is. That means mine was the two thousanth, eight hundred and third one built. Makes it pretty old, huh? I just gor a 2006 with less than 8000 miles. I appreciate the info Thanks. Welcome to the group. Join us for some of our adventures. Recently Dale "Cash" had asked some detailed questions as others have also which I then forwarded to Bob Walczyk our former GM SSR Product & Marketing Manager. Bob has been a real great resourse to me and to all of us here on ssrfanatic.com. Below is part of my response back to Bob today. I want to thank you for taking the time to continue to help me out with our member's questions. You have been a wealth of knowledge for all of us and one of our greatest supporters of our SSR community as well. Marc, Is there a password needed to open file? Worked perfectly for me. Thanks, I'm saving in my computer files and printing a copy. ONE BAD DOX DACHSHUND OWNER or is it the other way around?????? "Laugh when you can, say sorry when you should, and let go of what you can't change." Scott I will add jpeg images for those that can't open up the doc file. That is so cool Mr Walczyk is willing to take his time to respond to this stuff. So, a VIN for Pace 1! I can't believe I got Mears name in on #26 and not Gil de Ferrans! Where's my embarrassed smiley? I was curious about the Mears truck also though. Now to try and decipher what he said about the balance of the 68! That is so cool Mr Walczyk is willing to take his time to respond to this stuff. So, a VIN# for Pace 1! I can't believe I got Mears name in on #26 and not Gil de Ferrans! Where's my embarrassed smiley? I was curious about the Mears truck also though. 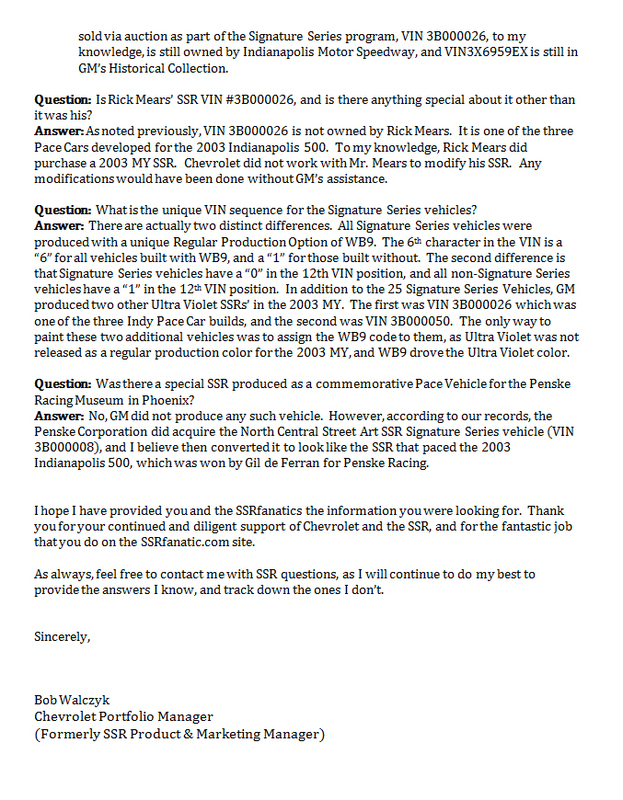 The Penske information concurs with info I got from Castrioneves' Penske Manager. He is still to get back to me to confirm as they were prepping for the Toronto Indy but he figured it was Signature #8. He said it was sent to the same 'builder" that put together the Pace vehicles so that it would be identical. I believe that truck is in the Penske Museum in Eastern U.S., not the Scottsdale one. I can tell you this, Rick's 03 was black; first thing he did was lower it front and rear; we're both old So Cal lowriders; got rid or the SSR in early 06, right after picking up a silver HHR, he also lowered right away. Bob Walczyk is top notch, I wish him well. Cash I knew you where the man for the job, keep digging. Hey Reb! Sssh! Don't tell Marc but I'm already at work on his next homework assignment! And yes, it is great of him to take the time for this and also of Marc to arrange it. You shoulda asked.......I didn't have the full serial number of the primary pace truck, but the Signature scrapbook had it as 6959EX. After reading Bob's information, I had to go back to Indy history to double check one thing that turns out to be wrong in the Signature scrapbook. There are two references to Helio Castroneves being the winner of the 03 race. He won the 2002 race, but according to the records, Gil de Feran won the 2003 race. Great tidbit of information regarding Signature 8 being redone to match the pace truck. Having dealt with him in 2006, I'll second that. 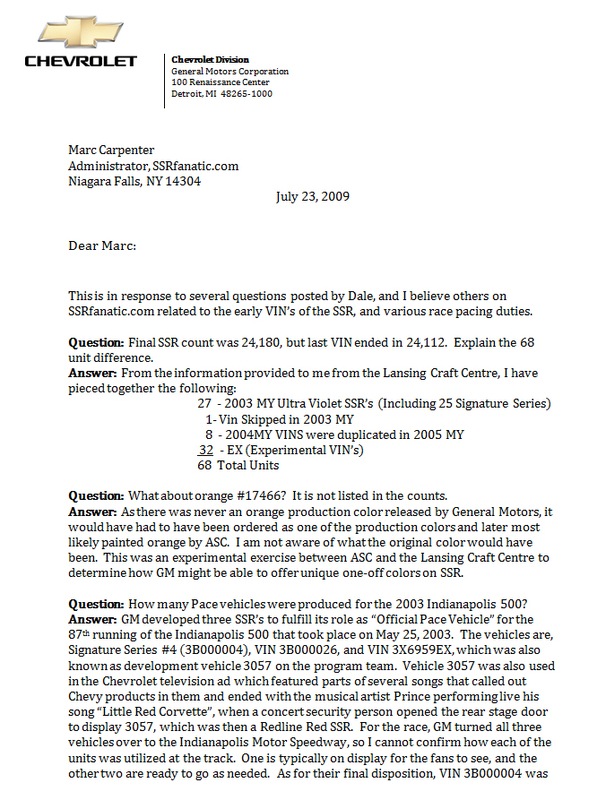 Marc, I would like to know about all the 2003's. Freezer said some of the SSR's with a 300 Vin # were test or crash vehicles. I know some of the 03's were PEP's including mine. But how about the ones that never made it to a GM dealership? Isn't that funny. I thought I remembered seeing other references to the Mears truck as being Redline, or maybe I am confusing that with the actual one given to de Ferran for winning the Indy. I am trying to obtain that VIN also via Penske Racing. So it was . I am not sure if I interpretted your note correctly but seems you know/knew Rick Mears, not just have lowriding in common. If you know the VIN or have easy access to it I would like to make note in the registry, sold or not. The VIN may already be there but even if it is I can attach his name to the vehicle history. Oops, just remembered I had a conversation with Jeff (Blue Thunder) about this also. This is a part of where I am trying to get to. My original goal was to document the first 500 or so including pre-production, Signature, Pace etc, how many were lost/destroyed and the 68 missing VIN's to 24180. #23101,#23278,#23898, 2 Paces and "Hellvis"
Really enjoyed reading the detail Marc. It's great to get this information formally documented.